Before rock & roll gave listeners the Traveling Wilburys, country music spawned the Highwaymen, a super group of mythic proportions that featured living legends Johnny Cash, Willie Nelson, Waylon Jennings, and Kris Kristofferson. This tribute looks and sounds like the original line up. 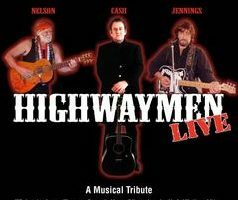 Their show includes several top 20 singles including “Highwayman”, “Desperados Waiting for a Train” and “Silver Stallion”. Also included with each performance are the stories and smash hits of the individually portrayed icons like “Folsom Prison Blues”, “Ring Of Fire”, “ Good Hearted Woman”, “Help Me Make It Through The Night”, “Blue Eyes Cryin’ In The Rain”, “Crazy”, “On The Road Again” and many, many, many more. Any crowd anywhere will stomp their feet along with these entertaining outlaws & Good old boys!